Red tea is technically an herbal tea – which is a broad category and one that is quickly gaining in popularity alongside green and white teas. With its wide range of flavors and profiles and its complete lack of caffeine, herbal tea is an ideal offering for large (and often picky) groups of people. Red and Herbal teas are not like green, white, black, and oolong, which are made from the Camellia sinensis plant. 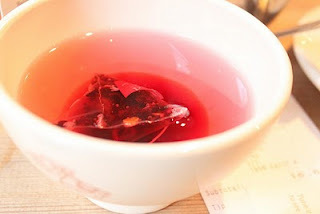 In fact, reds and herbals aren’t actually teas (the phrases are misnomers). True teas are all and only made from the C. sinensis plant – the color of a tea is determined by the degree of processing it undergoes. Herbal infusions, then, are called tisanes or ptisans, a Greek word for a drink made from pearl barley. So-called ‘red tea’ is a tisane of the rooibos, (Afrikaans for red bush) or African red bush plant. Because herbal tisanes are not made from the C. sinensis plant, they have no caffeine. Some of the plants used to make tisanes are, however, said to have stimulant properties. This is on a case-by-case basis and is the province of herbalism. Preparing herbal and red tisanes is fairly simple. Most are brewed with freshly boiled water for an initial steep of three to five minutes. While commercial tisanes may have specific instructions, any homemade tisane will do well with this standard steeping guideline. Red, or rooibos, tisanes were developed by the Dutch settlers to the Western Cape region of South Africa as an alternative tea to the expensive sea-trade shipments of black tea at the time. The red bush plant is only grown in that particular region, but the popularity of the ‘tea’ has spread worldwide. It provides significant antioxidants such as aspalathin and nothofagin as well as other phenolic compounds. While official studies on health benefits are scarce, rooibos tisanes are said to assist with nervous tension, allergies, digestive problems, infantile colic, asthma and dermatological problems. I’ll admit the alchemic appeal of concocting my own aromatic and healing brews has fascinated me since I was knee-high to a grasshopper. My favorite herbs are rosemary, peppermint, and yarrow (not together). If you have a favorite herbal tisane blend or product, leave it here in the comments. Here’s a low-cost, five-star-rated tea to start you on your journey. Twinings is always a win; if you’ll like rooibos, you’ll like this. Quick tip: Red tisanes are known for losing their flavor after the first brew. Don’t waste your time; use a new bag for each mug. >This is by far my favorite of teas. An advocate of tea sipping, I also partake of the southern tradition of sweet iced tea (orange pekoe), though no sucrose, thank you. I visit the local Asian (Islamic or Hindu) markets to get a broader range of selections. Off-the-shelf bagged teas tend to lose some of the flavors that loose teas offer. However, back to red tea, I find this leaf is settling to my digestive system and produces some comfort when I am hungry or simply in an agitated mood. Good job of in-depth discussion, Wade. >Genital herpes has been a well known and very taboo sexually transmitted disease for decades. even occasionally thoughts of suicide in some cases.